SACRAMENTO (CN) – Magnifying the feud between California and the Trump administration, U.S. Attorney General Jeff Sessions backed up a lawsuit filed Tuesday over California’s sanctuary state laws with a warning on Wednesday: federal agents will continue deporting undocumented Californians. 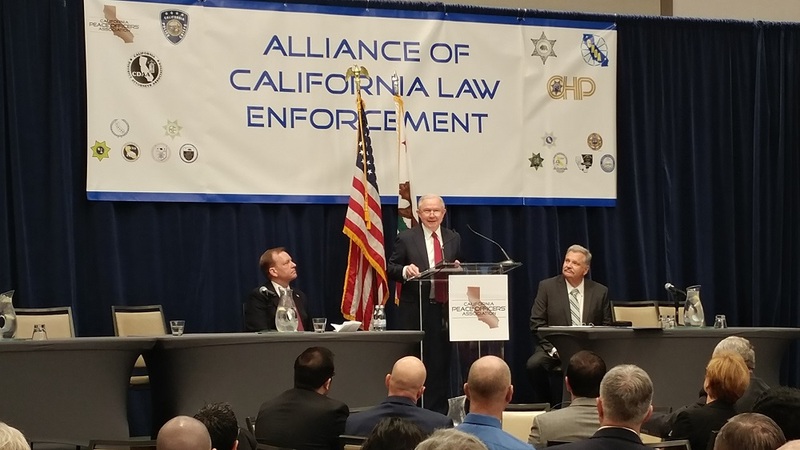 Sessions ripped into recently passed state laws limiting state and local law enforcement officers’ cooperation with ICE agents and requiring state inspections of federally operated detention centers in California. He also had a stern warning for any Californian thinking the only answer might be to leave the union. “I understand that we have a wide variety of political opinions out there on immigration, but the law is in the books and its purposes are clear and just. There is no nullification, there is no secession, federal law is the supreme law of the land,” he said. The former Republican senator from Alabama admonished the Golden State’s elected officials at the meeting – held blocks away from the statehouse – for passing pro-immigrant laws just one day after suing Gov. Jerry Brown and California Attorney General Xavier Becerra in federal court. Brown, who did not attend Sessions’ speech at the California Peace Officers Association event, said the laws were not enacted to disrupt ICE agents but to protect undocumented immigrants in the state’s bustling workforce. The Democratic governor – and former state attorney general – called the rare visit from the Trump administration to the state which overwhelmingly voted for Hillary Clinton an “unprecedented” political stunt. The federal lawsuit says three recently passed immigration bills violate the Supremacy Clause of the Constitution and jeopardize the safety of federal agents and California residents. “The provisions of state law at issue have the purpose and effect of making it more difficult for federal immigration officers to carry out their responsibilities in California,” the complaint filed in Sacramento states. Sessions took aim at Oakland Mayor Libby Schaff for warning residents last month about a planned ICE operation. He said the mayor’s alert allowed 800 “criminals” to escape ICE agents during a statewide sweep that netted 232 people. 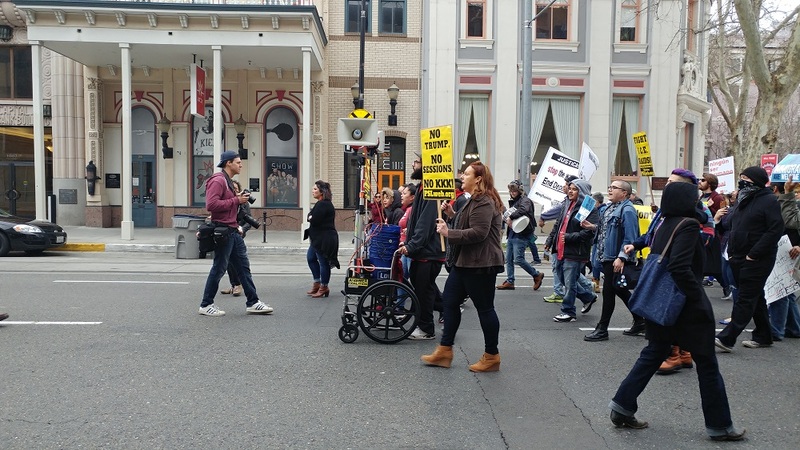 “So here’s my message to Mayor Schaaf: How dare you? How dare you needlessly endanger the lives of law enforcement just to promote a radical open borders agenda?” Sessions charged. The police officers in attendance did not interrupt Sessions’ speech with applause, and not everyone stood to clap when he finished. Meanwhile outside the venue, hundreds of protesters, including some state lawmakers, rallied against Sessions’ Sacramento visit. State Sen. Steve Glazer, a Democrat from the San Francisco Bay Area who voted for the three bills being challenged by Sessions, told Courthouse News the visit was a “poke in the eye” with all the makings of a political stunt. Republican Assemblyman and gubernatorial candidate Travis Allen rejoiced over Sessions’ lawsuit and subsequent California visit. He tweeted that it was “about time” for the federal government to end his state’s sanctuary laws. The Justice Department’s case is assigned to U.S. District Judge John Mendez, who was nominated by President George W. Bush in 2007. Brown, in perhaps his strongest anti-Trump rhetoric yet, blasted the lawsuit against the nation’s most populous state. State Attorney General Xavier Becerra added that the three laws were crafted in concert with federal laws and that nothing prevents local and state law enforcement agencies from cooperating on legitimate immigration actions. He reiterated that most violent crimes are exempted and that the pending lawsuit will open up the federal government to discovery. “Stay tuned,” Becerra said of the state’s legal strategy.